After attending this year’s Dreamforce, a number of friends and colleagues have asked whether Dreamforce is worth the investment of time and money. Here are my thoughts after attending for the first time. I think it is a worthwhile use of time for anyone involved in the industry, whether you are a marketer, executive, or software entrepreneur. Any eager “student of the game” may find value, as the conference is a good place to soak in the latest thoughts, technologies, and trends. The quality of the conversations and information available are pretty high. You can take part in a lot for free (although you won’t get meals and some other perks, but that’s not a big deal). The caliber of the speakers is very good. For example, the Prime Minister of Haiti was there, along with Sheryl Sandberg (Facebook) and Marissa Mayer (Yahoo). While money isn’t everything, it’s not every day that you get to participate in a session with billionaires, heads of state, and other people who are making a difference in the world via NGOs and other charitable organizations. It certainly seems like an investment worth considering. Given that there are 130,000 attendees, one certainly has an opportunity to be in front of a lot of people. However, I’ll reserve judgment on this until next year’s show (we intend to exhibit). I walked through at least 3 exhibit halls, but none were gigantic. They were each manageable in the number of aisles to walk and absorb. I believe there were 350 total exhibitors. To me, this means that as a newcomer, it is not impossible to get good foot traffic and generate conversations. How many of these turn into qualified opportunities remains to be seen. Because the aisles can get super-packed, it seems that companies who clearly state their value proposition (what they do for you) at eye-level or higher have an advantage. In some cases, I could not see what a company did because there were simply too many people in the aisles. However, if their value prop was placed in a location above everyone’s head, it was easier to decide whether or not to make a stop. Overall, outside of getting the flu and having to stay within a few hundred feet of a bathroom (yuck), I had a great time at the show and am definitely eager to return next year as an exhibitor. 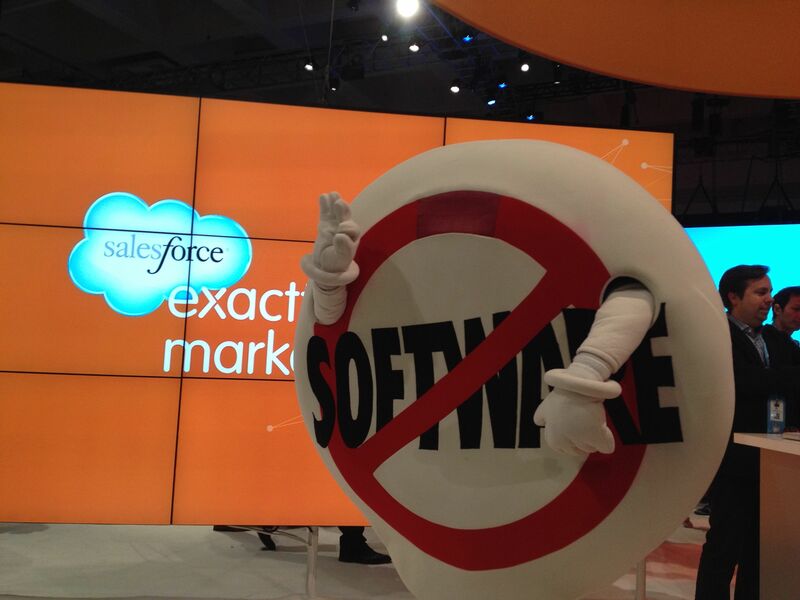 I would say that YES, Dreamforce is worth it and is an event that should be considered. What about you? Do you think the show is worth the investment of time as an attendee? How about as an exhibitor?